Seeing the all-decisive round 2 in the Girls’ section yesterday, the Junior section joined the action today with 4 victories out of 5 games. While the Girls’ section overall was more peaceful, the Nastassja Matus vs. Sophie Morris-Suzuki king hunt game featured enough excitement for the whole group! The game of the day was IM Praveen Balakrishnan’s upset win over GM Andrew Tang. Tang went all-out to trap Balakrishnan’s queen, but Balakrishnan was able to obtain three minor pieces in exchange. 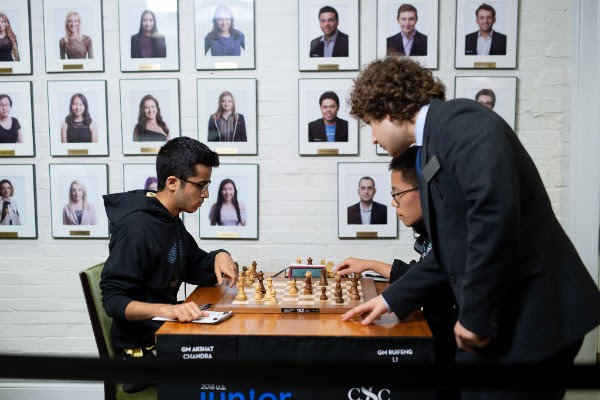 In the resulting position, Balakrishnan had a clear advantage because of his well-placed pieces and lack of weaknesses, which he gradually converted into a victory. The middlegame of GM John Burke vs. FM Alex Bian was a fascinating battle of ideas, especially when Bian found the maneuver 22...Qh8! ?, allowing the queen to contribute to his queenside pressure while stabilizing his kingside. However, Bian blundered later with 33...Kf8?, allowing Burke to play 34. Be6!, setting up the eventual but unstoppable threat of a heavy piece reaching g8 for checkmate. In Akshat Chandra vs. Ruifeng Li, Li began the game in his usual style with the unorthodox 1...Nc6, surprisingly allowed a transposition into the Ruy Lopez, and then returned to his unconventional ways with 4...g6. The unusual opening play led to a better pawn structure for Chandra, which he converted seamlessly. 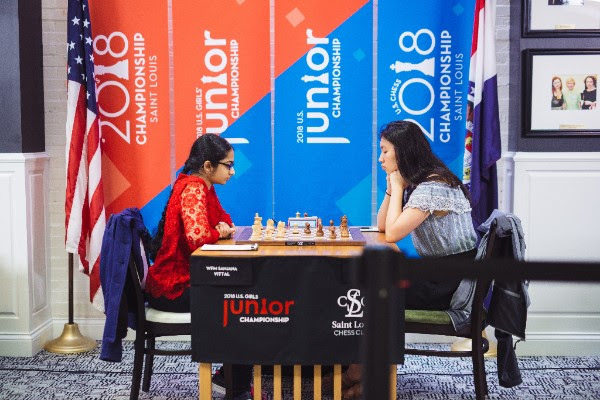 Annie Wang vs. Mika Brattain featured an unusual King’s Indian Defense where Black ended up with an isolated queen pawn. Brattain used his greater piece activity to gain a pawn, and he eventually converted a hard-fought endgame into a win. 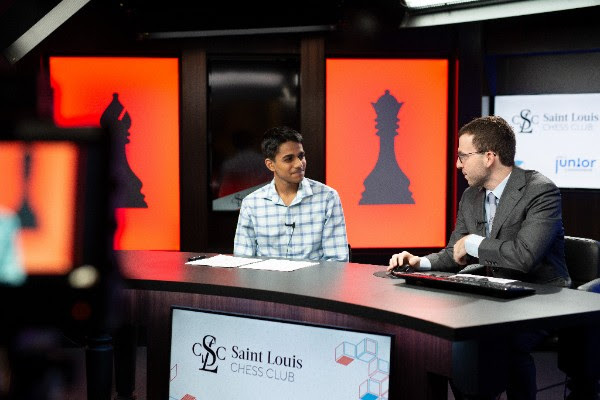 Advait Patel vs. Awonder Liang ended in a fairly quick draw, allowing Patel to reach 2.5 points and become the sole leader of the championship. The game of the day was Nastassja Matus vs. Sophie Morris-Suzuki, which featured a wild king hunt while three queens were on the board! Even though she entered the round with two previous losses, Morris-Suzuki played bravely for the win. In a reverse Sicilian, she sacrificed two pawns to create pressure on Matus’s king in the center. Though her king was in danger, Matus focused on her queenside counterplay, eventually promoting to an extra queen. Despite the vast material imbalance, Morris-Suzuki’s king attack raged on, and she had an opportunity for a draw by perpetual check. She courageously went for the win but overlooked how Matus’s king could escape. When Morris-Suzuki ran out of checks, Matus’s two queens finally had their say. 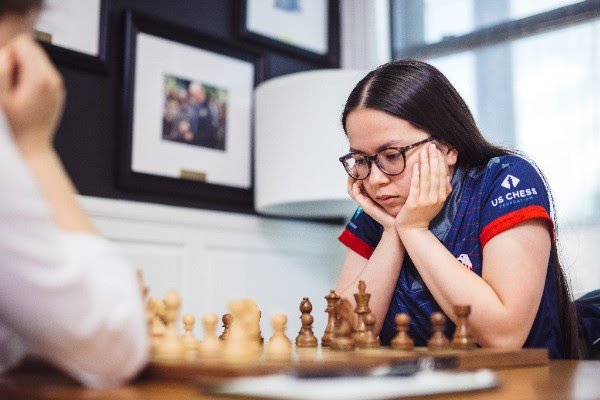 Jennifer Yu played an excellent attacking game against Sanjana Vittal, achieving a dream octopus knight on d3, which gave her control over the entire board. After so many decisive games yesterday, the rest of the Girls’ section ended with peaceful draws. Rochelle Wu had great attacking chances against Maggie Feng from the opening, but the attack fizzled out after a queen trade. In the endgame, it was Feng who had chances to press her slight advantage when the two decided to repeat the position. 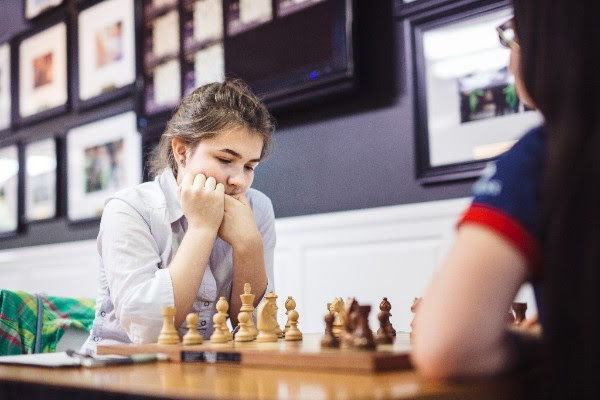 Thalia Cervantes pressed against Martha Samadashvili for over 80 moves but the game eventually liquidated into a bishop and rook vs. bishop and rook. Emily Nguyen and Carissa Yip drew to retain their half point lead over the field. Tune in tomorrow to see if we’ll finally have a clear leader. Photos courtesy of Saint Louis Chess Club, Austin Fuller. Copyright © 2018 Saint Louis Chess Campus, All rights reserved. Watch the games of the U.S. 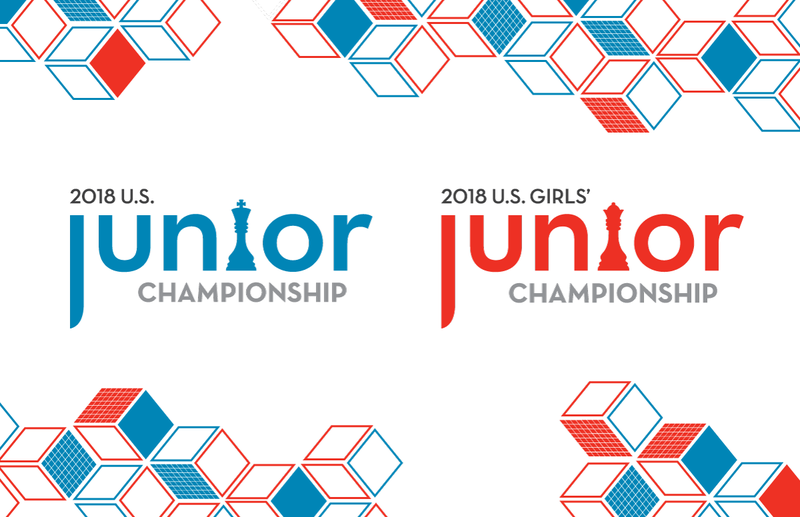 Junior Championship and U.S. Girls Championship with computer analysis LIVE on ChessBomb.